I found this old green pillow while thrifting with a friend one time at one of our local shops. I was immediately drawn to the velvety material and round shape. After I got it home and washed it, I started experimenting with it. I gathered up all my orange and yellow buttons and started placing them on the pillow cover in the shape of an "M." Using fabric glue, I glued each button down exactly where I liked it. Once it dried, I sewed the buttons on with embriodery thread. 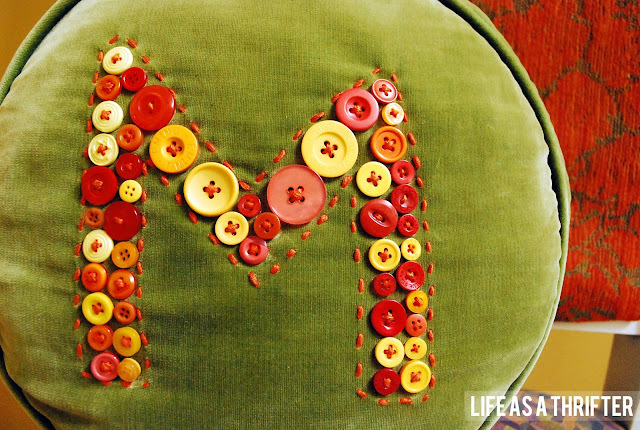 Later, I lightly hand drew the "M" outline with a pencil and sewed over my pencil marks with the same orange embroidery thread. I LOVE THIS!! 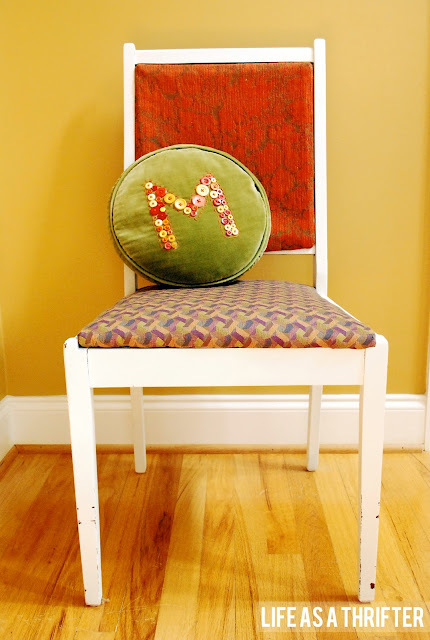 I'm totally stealing this idea for a purple guest bedroom pillow just like yours! Thanks for the great idea! !